A moral tale of two sons. The "good" son who stayed near and dear, living a life of selflessness and perfect care. Dutiful, responsible and true. The "bad" son, the prodigal, strayed far from home and wasted his youth and his future in folly. Irresponsible, the ne'er do well, the pariah, lost to his family forever. The "bad" son, returns home to a heroes welcome. The "good" son feels betrayed. The reunion is a disaster. Except, this is not where the story ends. It is merely, the last sentence on the page. The storyteller ran out of ink on purpose. For a very long time, I too, refused to turn the page. Talked myself into cheering for the faithful son, and defining the wayfarer as a cheat. Ha, I thought. So you can go out in the world and mess up and do anything you want and turn your back on your family, and then when your pockets are empty, your luck has run out, you can run home to Mommy and Daddy and say "Sorry About That" and all will be forgiven. Not fair. Not fair at all. I was the dutiful daughter in this story. I didn't blame the "good son" for yelling out loud, Hey What About Me? I mean, really. REALLY. Somebody wake these parents UP. You have two sons and one is a real slacker. The other is right here, right under your nose, doing the right thing at the right time for all the right reasons. So you throw a BIG PARTY for which one? Are you kidding me? Then I became a parent. Of two sons. And I decided it was time to finish the story. To turn the page. To see if I had missed something in translation. Skipped a paragraph. Read only the Cliff's Notes version. I am a parent. Of two sons. I love them both. I always will. No matter where they are or what they do. An equal share for equals. Even though I said things like, "just because I said so", when they were growing up. Shored up the boundaries will bricks and mortar, monitored their language, scared their friends, taught them to cook, to make their beds and fold the laundry. Forced them to eat their peas and finish their homework. I followed the Parent Manual and treated them exactly the same. I was fair to a fault. They should have turned out like twins. Maybe if I had dressed them alike? In cute overalls and matching plaid shirts. That, even to me as I write it, is a VERY creepy idea. Two completely separate and unique people with ideas, dreams and ambitions of their own. I stood with them, hand in hand, on the edge of the nest, and I will admit it. I pushed them out. Well, actually one of them was already out on the end of the limb hanging upside down without a parachute. The other one, I had to nudge a little bit with one toe, even though he was wearing a safety harness, a helmet and safety goggles. To say that they flew in opposite directions is woefully inaccurate. One flew in swoops and dives while wing walking his way from one risk taking adventure to the other. The other flew in a perfectly straight line, atlas in hand, itinerary crafted with military precision in ABC order. You would think that they had nothing in common. Separated at birth. One raised by a pack of wolves and the other in a well ventilated bubble. That story I mentioned. The one about the sons. This is a story about brothers. I see my two boys as sons. They see each other as brothers. Laughing and rolling on the couch, eating jerky and providing their own running commentary on stupid movies. The straight arrow, cradling the brother with the broken arm dangling at his side, not just with his arms but with his heart as well. The renegade , playing Best Man to a full house, reciting a speech, voice breaking. Pulling at his collar, the comedian of the family now desperately solemn, as he bears witness to his love for his brother. The parable, as it seems to me. is not a story of two sons. It is a story about two brothers finding their way home. The parent in the story does what parents do. Welcome their sons home with open arms and celebration. I love you forever is all we need to say, and all we will ever do. The brothers in this story are lost. No, not lost, stuck. The brother who strayed, needs a bit of straightening up. The brother who stayed, needs a bit of loosening up. And the quality of mercy. Because, as their mother, I know that they are both made of the same stock. Loving hearts, forgiving hands, and the ability to make each other laugh until they cry. Reunions are always messy affairs. Finding their way home to each other starts with three words. I'm returning the matching Spider Man XXL pajamas tomorrow. I have a deathly fear and healthy respect for spiders. I bear the scar of the bite of a brown recluse. I shake out my pillowcases at night and check in corners and crevasses for signs of webs and the detritus they leave behind after a mid-morning snack. In my house, because of my fear and vigilance, I control their fate. Outdoors, in the wild, in the garden, on my deck, they reign supreme. I honor their diligence in keeping aphids off my plants. I watch them jump and scurry undercover as I step on the rock beds to water late at night. We keep a safe distance each from the other. I stepped onto our porch and spotted the web. Tiny silvery threads from one corner post to another, some five feet apart. In between, a massive trap. Geometrically precise, a wonder to the eye. Light enough to sway in the breeze, yet enough tensile strength to withstand harsher winds. I knew, instinctively, that if I pulled it down with the handle of my broom, a new web spinner, spying at a safe distance, would return in the dark of night and mock me in the morning. Perhaps not only one new web, but another nearby. 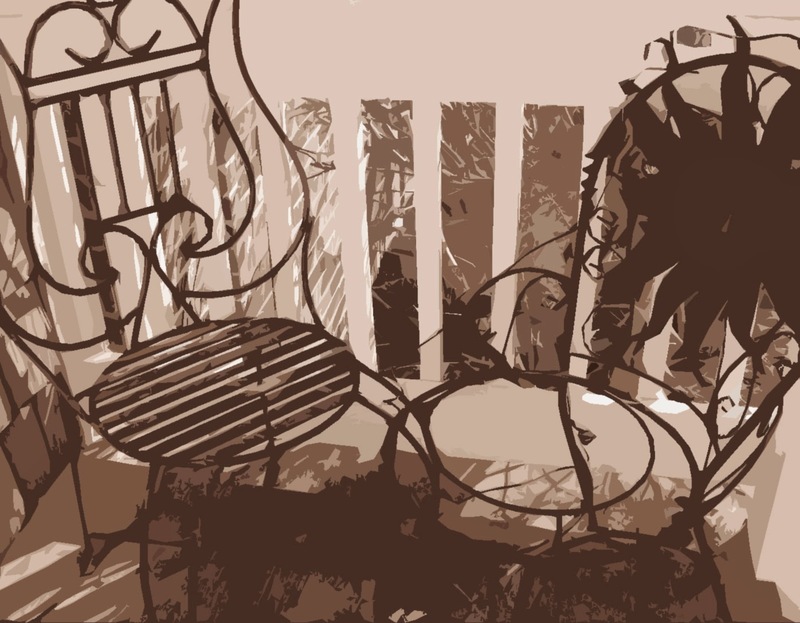 As I stepped back, I noticed one silvery thread, extending from the eave to the railing on the porch. In between, a much much smaller web, a mere glisten in the sun. 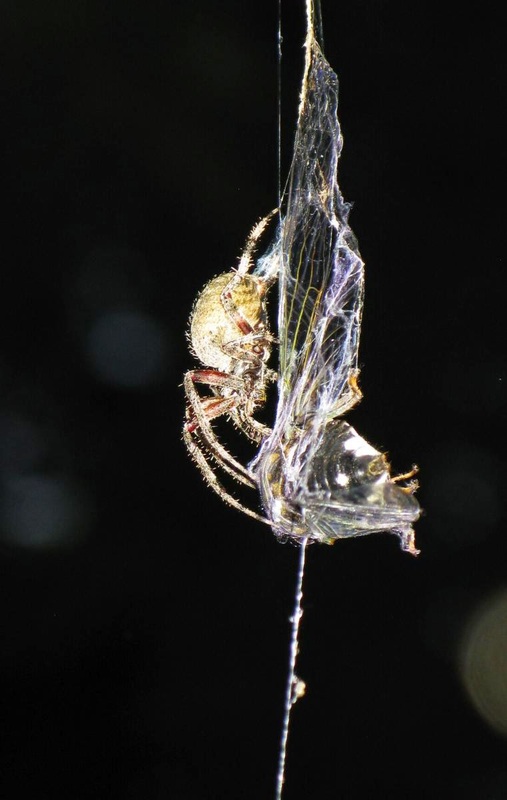 I was close enough to see its fangs and the intricate color markings on its body as it rested on the web. 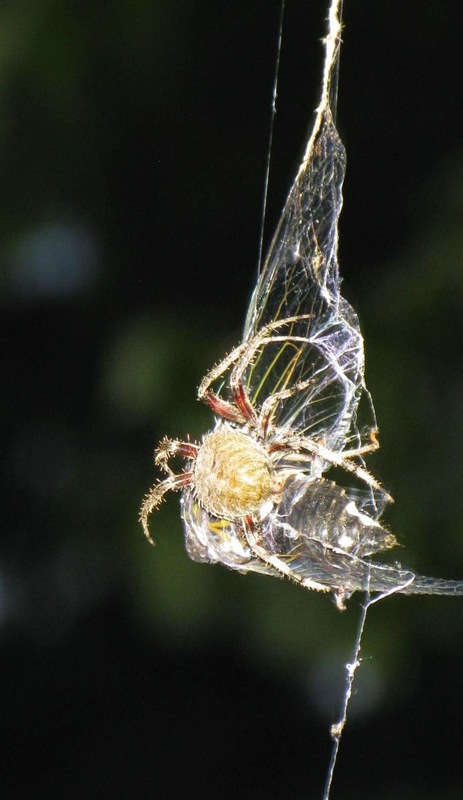 An orb weaver, I believe it was, known for the size and the remarkable pattern of the web it meticulously weaves, secured by a long thin strand from the edge of the overhang to the post on the porch. While the cicada thrashed and spun, the spider skittered up the long thread to camouflage itself from harm, in the dried leaves in the eave. I wanted to do something. Help somehow. Yet, I knew it was too late. 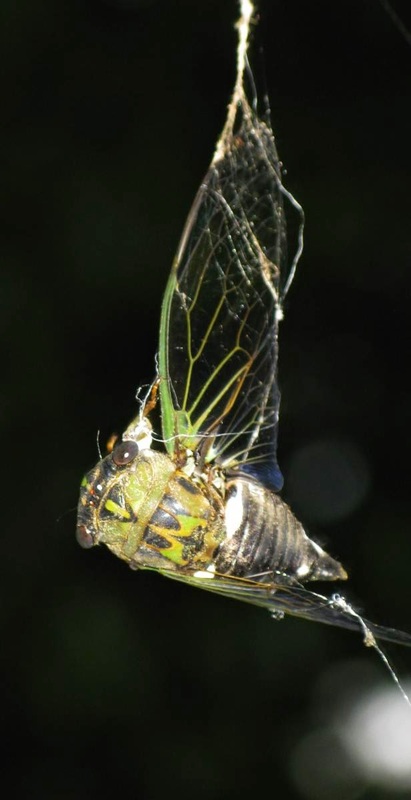 The venom from the spider's bite already circulating through the cicada's body, penetrating even deeper with each writhing squirm. Life and death in the garden. Every silvery link on the food chain on display. The hunter and the hunted. The predator and the prey. 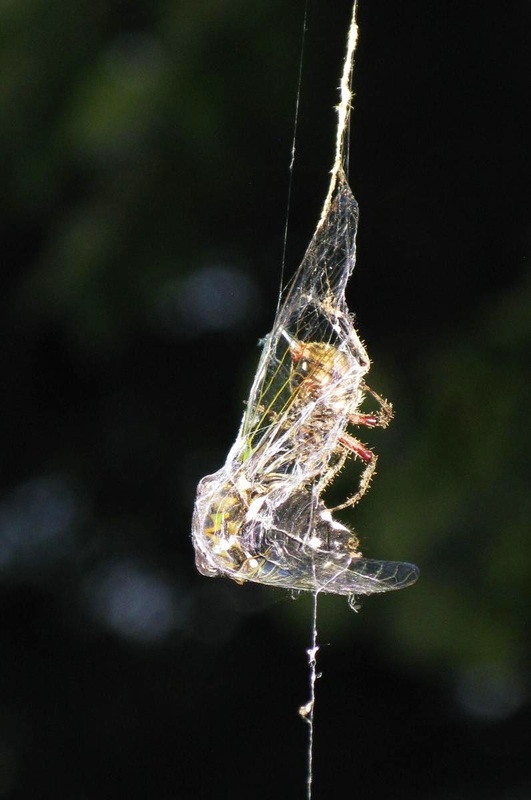 The cicada still singing in the birch tree and the cicada cocooned within the web. Luck? Fate? 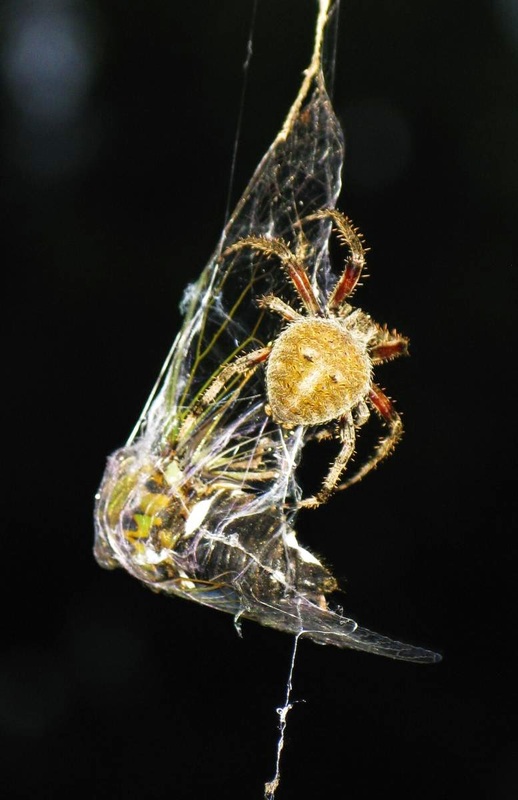 The Orb Weaver casts a spell. Sets a trap. It is a feat of almost magical design. 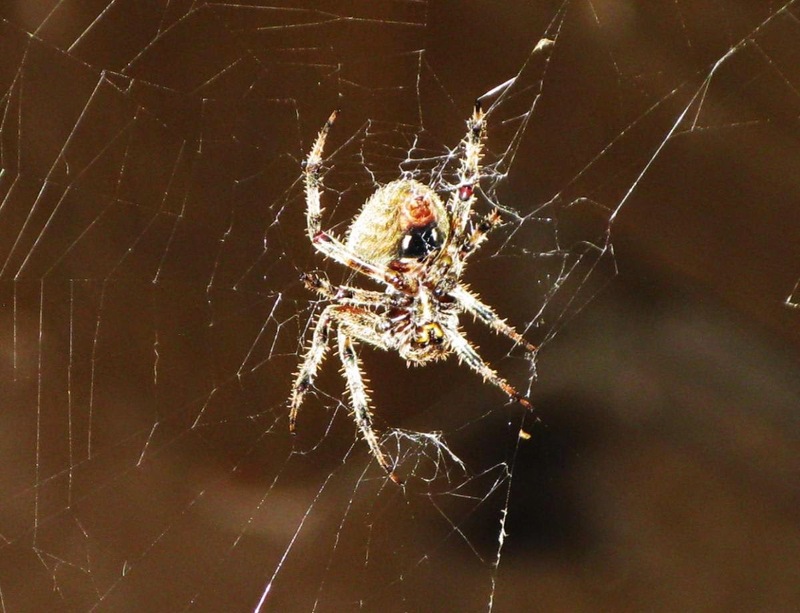 The spider spins and weaves in a geometric pattern, depositing a gooey tar paper layer on the circle of the web, while leaving the radii smooth as silk, so that the spider may flee rapidly away from the web and either descend to the ground or return speedily along the tightrope to the eaves. the very signal the spider has been waiting for. Now the arduous task begins. 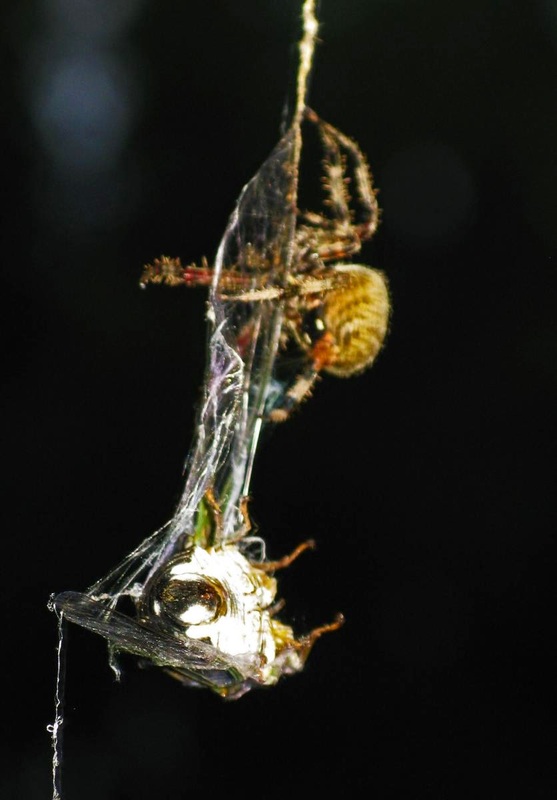 Slowly, carefully, the spider weaves a delicate shroud. Transparent as glass. Thin as tissue. Fine as lisle thread. I am only a few inches away. Every move is a dance. Every thread a precious metal. The tying up of loose ends. 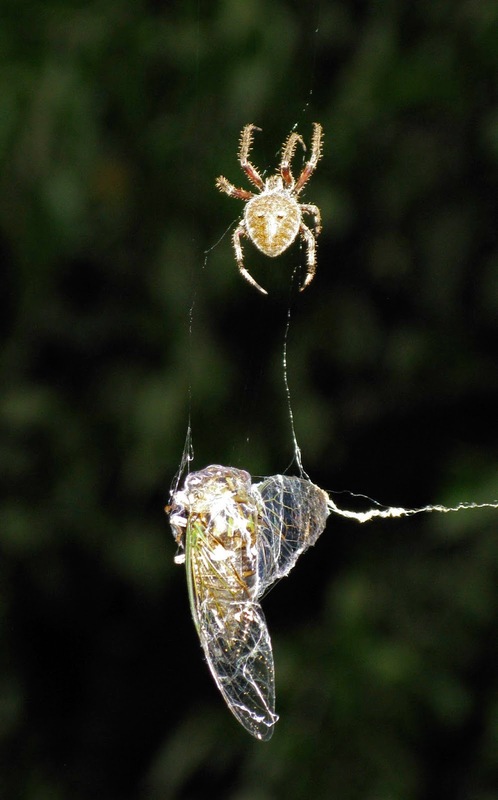 The spider and the cicada in the middle of the ring. Winner and loser. All part of a masterful design. And while I mourn the loss of the cicada, I am well aware that the spider is prey for the bats nestled patiently in the canopy waiting for dusk. 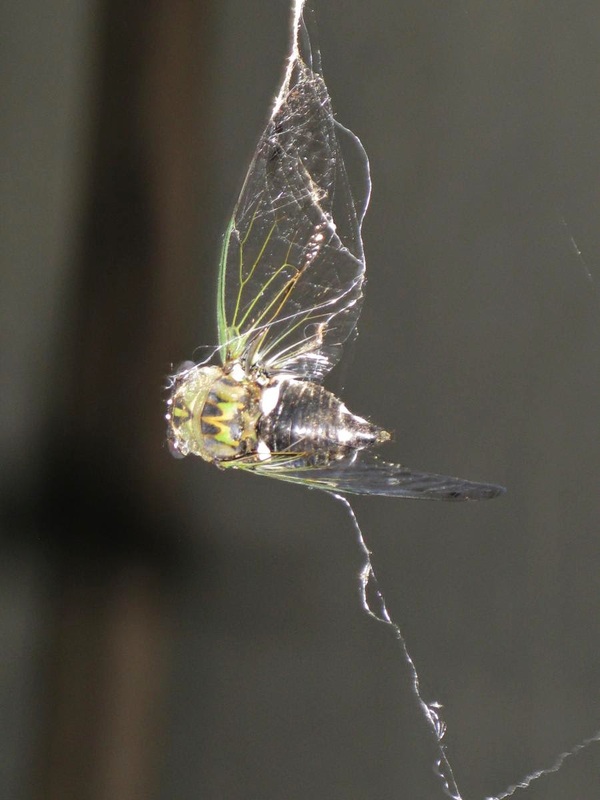 The cicada stumbled into the web at 5 o'clock this afternoon. It is now almost 9. And the spider knows I am here. It scampers up the thread to the eaves. To once again, sit and wait. I am the uninvited guest to this table. I wanted to write it. 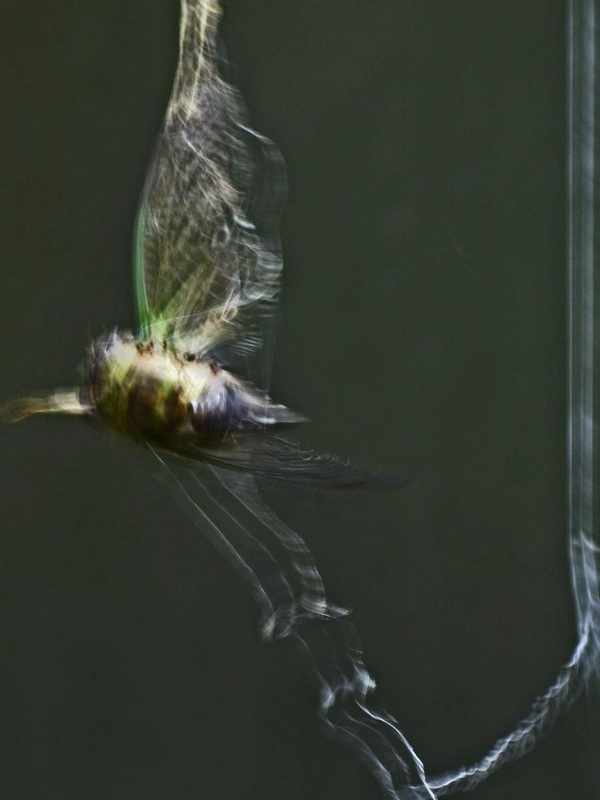 But outside, in the wild, in the garden, I am reminded that there is indeed, a space between life and death. Where I must walk softly and carry with me an open heart. Friend or foe? Foe or friend? Or perhaps, just travelers on the same journey. The journey from HERE to THERE. There's an article floating out there in cyberspace listing about 50 things WE do not use anymore. First of all, I abhor any article, essay or post that starts off with the phrase SOME PEOPLE...uh, unless I am the one doing it. I should have quit while I was ahead, BUT I was irritated before I even read the content. Actually, my temper was set on a slow simmering boil. Over the word WE. Who are YOU? Who is this person I have never met, never seen, that has no name, who gathered a BUNCH of SOME PEOPLE together for a STUDY about what WE all do or don't do? Were YOU invited to participate? Huh? Were you? Your neighbors? Your bus driver? Your cousin? Your mother-in-law? Well, yeah, I know her and she never misses ANYTHING. So. Ha. Ha. Ha. Here's the point. It's kind of funny. A list of all the uncool, unhip, the passed-the-sell-date, old, no longer any good, useless, done, gone for good stuff WE don't use and the unveiled implication that if YOU still DO use anything on the list, YOU are walking through the world hauling a club behind you, knuckles dragging in the dirt, chewing on raw animal innards, clueless to that group of SOME PEOPLE over there who have discovered FIRE and the MICROWAVE and are computer WISE GUYS wearing their cell phones in their ears or on their WRISTS and have a GPS to find their way home and are laughing at YOU Neanderthals who probably haven't discovered your opposable thumbs, so ha ha ha ha ha, how will YOU ever learn how to TEXT!!! So, let me grab a rock and draw you a picture on the cave wall. Maybe grab a few berries to make a more colorful story. I'd like to make a primitive Power Point if you will. True. Haven't used a travel agent in years, but so wish I had as the room with a view turned out to be a view from the year circa 1950. The bugs under the mattress, oh yes, they were au courant. True. Don't drive around looking for garage sale signs much anymore, but back in the day I scored the entire Ewok Village, a brand new still-in-the-box Millennium Falcon with eight of the best Star Wars figures inside, and even an X-Wing Fighter. NOW there is a show on the Travel Channel called the Toy Hunter, and if he'd just call, I could be his wing man and we could make a fortune. True. These days, I don't do much hand washing of delicate apparel. My old washing machine had two cycles. Regular and Permanent Press. The old girl lived a respectable 20 years. My new machine has 1,945 different settings, shrinks just about anything it touches, and breaks down if I whisper the word SPIN. Not to mention the repairman no longer makes house calls, and expects to "talk me through it" from somewhere in a foreign land and in a foreign tongue. I hang up after the word phalange. My mother taught me not to talk about such things with strangers. True. I don't carry change in my pockets for pay phones. I used to do that for pay toilets, too. Maybe if WE still had those, I wouldn't have to use one foot to push open the door on the way out, while grabbing a paper towel with my other hand, then switching feet so I can make the throw to the garbage can without touching the door handle or the faucet on the sink. Oh, and that is only after I embarrass myself by waving my hands under the faucet on all three sinks and there is no water, and then under the paper towel dispenser and there are no towels. True. I don't use a map while driving, but then the men in my life never stopped to ask for directions BEFORE so why do it NOW? NOW, the men in my life, listen to another woman's silky, throaty, come-hither voice on the GPS, leading them on, and they argue with HER, make the wrong turn 'cause they STILL know better, and get lost anyway. True. I don't have to remember PHONE NUMBERS anymore, but now I have to recall 2,902 PASSWORDS that at one time were the names of my least favorite relatives, but now I am told they must be STRONG PASSWORDS, so I keep them on a list SOMEWHERE that I could probably remember if I was still using what's left of my memory neurons to store the old phone numbers I used to know by heart. FALSE. Now to the good part. 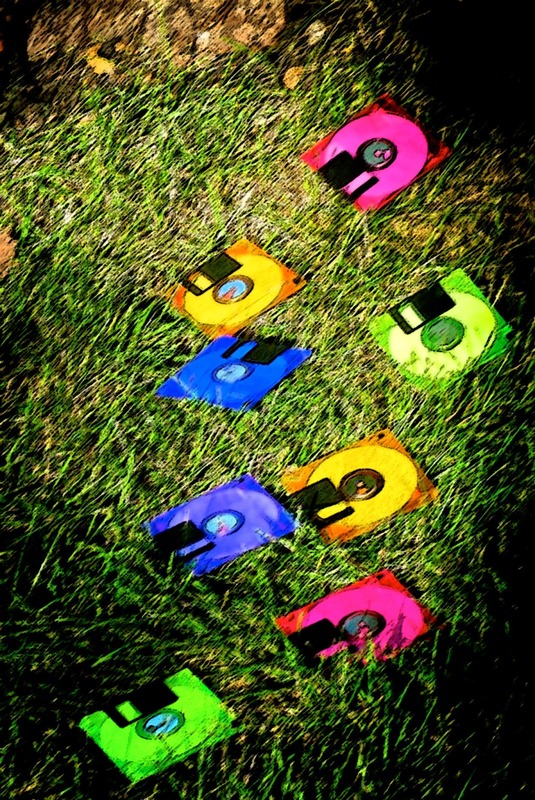 I still have CD's. Lots and lots and lots and lots of them...and so do SOME very close relatives of mine, many quite a bit younger than I and now THEY are coming home and searching the basement stash for VINYL LP's. Ha! And if I am the last person on the face of the planet to have a Sony Walkman CD player, I will make a fortune, a fortune I tell you. FALSE. I still print out pictures. At home and at Walgreen's and I still make photo albums. And one day, SOME PEOPLE will wish they had too. One day SOME LUCKY PEOPLE will get a card from me with a few "snaps" tucked inside and they will put them on the refrigerator door with a magnet and not feel quite so far away from the ones that they love. FALSE. I still write LETTERS. Real ones. On paper. In ink. With a pen. Sealed in an envelope. With a stamp. And I sign it I LOVE YOU. I send cards. Cards you can keep in a box. Or put on your desk at work. Cards that make you laugh. Cards that say I miss you. Cards and letters that say I care. I will admit, with a heavy sigh, that I don't receive that many anymore. But I still have just enough to remind me that WE just might not mind opening the mailbox and finding YOU there. SOME PEOPLE THOUGHT THEY WERE COOL. NOT. Trust me. It will happen. But the secret? Wait. Wait about ten more years and these same smartie pants will be on stage wearing a version of what YOU wore in high school and thinking THEY invented rattails and acid washed jeans. WE will leave a light on in the cave for YOU. we left behind in the moonlight.